The Universal Declaration on Bioethics and Human Rights, 2005, marked a significant step towards the recognition of universal standards in the field of science and medicine. This book provides an overview of the ethical and legal developments which have occurred in the field of bioethics and human rights since then. The work critically analyzes the Declaration from an ethical and legal perspective, commenting on its implementation, and discussing the role of non-binding norms in international bioethics. The authors examine whether the Declaration has contributed to the understanding of universal or global bioethics, and to what degree states have implemented the principles in their domestic legislation. The volume explores the currency of the Declaration vis-à-vis the more recent developments in technology and medicine and looks ahead to envisage the major bioethical challenges of the next twenty years. 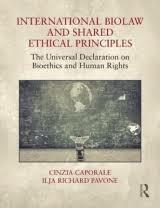 In this context, the book offers a comprehensive ethical and legal study of the Declaration with an in-depth analysis of the meaning of the provisions, in order to clarify the extension of human rights in the field of medicine and the obligations incumbent upon UNESCO member States, with reference to their implementation practice. Ce contenu a été mis à jour le 26 janvier 2018 à 19 h 33 min.